Ephraim Radner challenges the notion that historical-critical study alone leads to a right understanding of Scripture. In its place, he retrieves and restates the basis for a figural reading of Scripture. As might be expected, the scope of Radner’s argument is massive. But Radner appears to have mastered a nearly endless stream of material. Still, he struggles to communicate clearly. Radner’s argument often feels underwhelming because he tends to write in an exploratory manner. Of course, he may intend to do so to protect himself against critiques from historical-critical readers and others. Yet I found reading Time and the Word somewhat disappointing due to a lack of clarity in its argument. If I understand his argument, Radner maintains that Scripture draws us into its world because of its divine character. And for Radner this makes somewhat moot the question, “But did it happen?” (See 260–261). Instead, what matters is the figural sense: “[the figural sense] stands for the general approach of reading the Bible’s referents as a host of living beings — and not only human ones — who draw us, as readers, from one set of referents or beings to another, across times and spaces, whatever these may constitute” (6–7). For Radner, however, figural reading is not a tool of exegesis. It derives from a specific understanding of creation, God’s providence, and the creative and living nature of the word (7–8; 113). The living word is living since, it seems, God imbues Scripture with a “timeless-temporal reality” (100). Certainly, Radner’s work merits praise for its mastery of sources and careful argumentation. For example, he resists falling into the overly simple paradigm that Ockham’s nominalism led to modernism or the dismantling of Christian metaphysics (129–130). He does not deny, of course, Ockham’s influence in the history of thought. And I think he is right here as Charles Taylor’s A Secular Age has demonstrated. The transformation of the modern age comes through many different influences. Still, I am not sure how successful Radner’s thesis will be given the difficulty of his prose. And it is not just difficult, it also suffers from lack of clarity. While granting the exploratory nature of Radner’s work, he nevertheless can be faulted for providing too much-uninterpreted evidence. The success of his thesis may also suffer because, despite having four example sermons that use figural readings, his proposal is too theoretical. How can a teacher or pastor (who are also part of his audience—or at least he wants to influence preaching [eg., 259]) understand and use Radner’s proposal practically? I am not sure I can answer that question after reading Radner’s volume. Both non-critical and historical-critical readers of Scripture will also find his reorientation away from authorial intent and the question of “did it happen” difficult to stomach (258–259). But Radner seems to mean that these things are impossible to prove on a universally acceptable historical basis. But is God’s providential and active creation through the word more plausible? Not at all. So, I wonder why he feels that he must reorient the discussion so strongly? From an evangelical point of view, I grant that my tradition has often downplayed the divine character of Scripture to the point that divinity has become swallowed up in the human author. But he seems to swing to the other extreme in which the human character of Scripture loses its reality by being subsumed by the creative and active providence of God who becomes present to us or to whom we become present by engaging Scripture. Those interested in retrieval, metaphysics, Platonism, and hermeneutics will find Radner’s volume stimulating especially if one comes out of a historical-critical tradition. Pastors should not read this book due to its unnecessarily difficult prose and arguments. Instead, pastors should read Craig Carter’s recent work Interpreting Scripture with the Great Tradition. 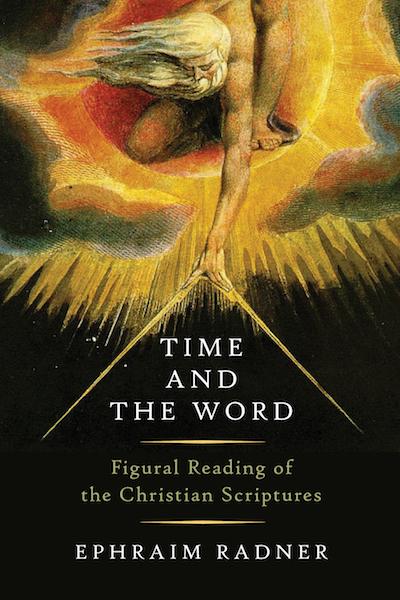 Disclaimer: Eerdmans provided me with a review copy of Time and the Word, although I was under no obligation to give it a positive review.